The monsoon months provide some of the best scenic visuals all around the country, and this makes it a popular time to book monsoon treks in India. While the rainfall is not usually heavy in the mountains, it is peak season time for some of the top monsoon treks in India. Here are the favourite destinations for monsoon treks in India across Uttarakhand, Himachal Pradesh, Maharashtra, and Kashmir. Known to be a world heritage site and part of the Nanda Devi Biosphere, covering a wide area of 87sq kms, the Valley of Flowers is home to many wonderful species, varieties of flora and fauna. The peak blooming season is right through the monsoon from July to August, making this a top monsoon trek in India. Every few days, new flowers bloom, creating a kaleidoscope of colours across the valley. 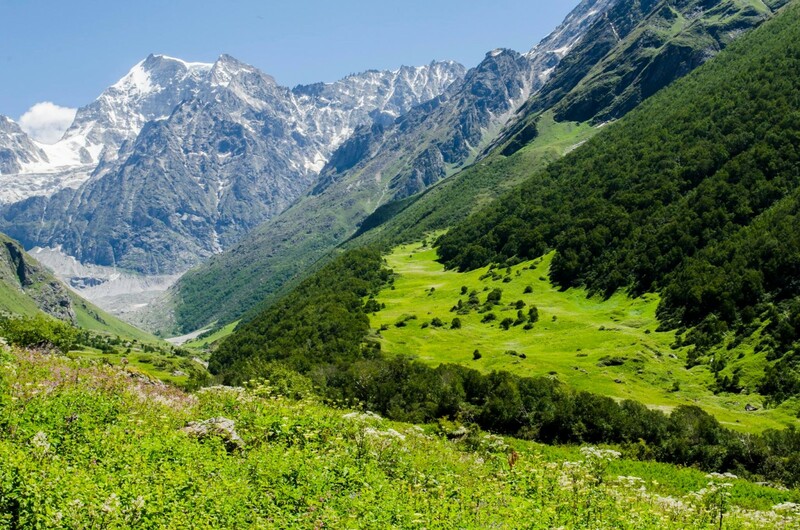 The valley is home to a vast range of endangered species, such as the Asiatic black bear, brown bear, and the snow leopard. Cascading waterfalls, rolling mist, green slopes dotted with flowers, and an easy trek experience makes this one of our top votes for best monsoon treks in India. The Hampta Pass Trek offers some of the most glorious scenic views. From verdant pastures, open meadows with fragrant sweet grass, cattle grazing, and sparkling streams, this is one of the most picturesque monsoon treks in India. You’ll trek from Kullu valley, filled with greenery and nature, through the challenging Hampta Pass, and then over into the Spiti valley, where the landscape is stark and dry. This monsoon trek in India ends with a real treat: a visit to the glittering gem that is Chandratal lake. This is one of the top monsoon treks in India, but it’s also a long one. It takes you up to the famous Bhimashankar temple which stands at 3000 feet. The trek can be done via two routes: Ganesh Ghat or the Shidi route. The former route is considered to be the easier one and can be used by first time adventurers, but is longer than the other. The Shidi route takes you along a route with ladders to cross the steeper sections, and requires some elementary rock climbing. If you’re a fit first-timer looking for a fun challenge, try the Shidi route. This is one of the top monsoon treks in India not just for the route, but for the chance to spot rare birds and the giant Shekru squirrel of Maharashtra. In the monsoon, you’ll trek along spectacular misty trails with waterfalls dotting the landscape. Kalsubai Peak, with an elevation of 5400 feet, is the highest peak in the Sahyadris, and one of the best day treks in Maharashtra, especially in the monsoon. The view from the top of this 'Everest of Maharashtra' is stunning and offers great photography opportunities, but the real reward is the thrill of conquering this peak. There are some rocky sections that can get very slippery in the rains, and some slopes that are quite steep, making the Kalsubai trek on of the most challenging day treks in Maharashtra. En route to the Kalsubai peak, you’ll find beautiful streams and pools that invite you to take a break and enjoy your surroundings. 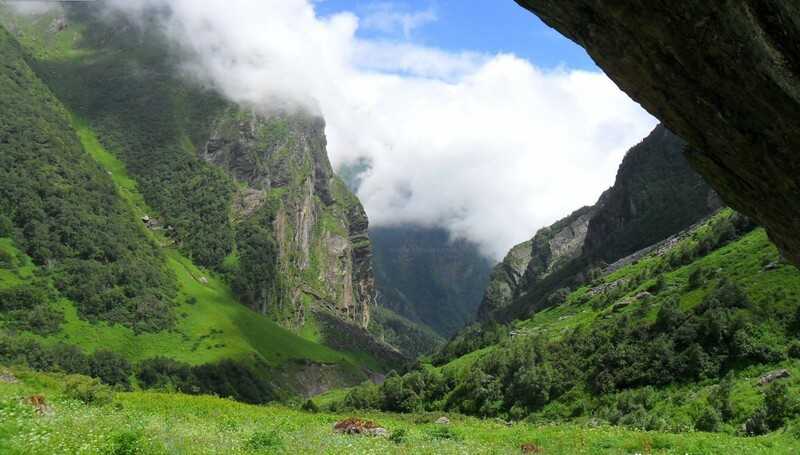 The Andharban trek is one of the top monsoon treks in India because it is a unique full descent trek. The start point is at the top, and you’ll descend into a forest so thick that the sunlight can barely penetrate the green cover. This day trek in Maharashtra takes you downhill for almost 4 hours, and you’ll be walking along a ridge, past waterfalls, and amidst butterflies, birds and flowers. It is a downhill trek, but don't be fooled into thinking that this is an easy trek. The path can be slippery, and there are spots that you'll have to climb over very carefully. This high altitude trek is best undertaken during the monsoon months of June to September. The flowers are in full bloom, the skies are very clear, and the trails are clear of snow, making this a top monsoon trek in India. You’ll also find that the lakes are at their fullest best. The Vishansar Lake offers some great photography opportunities, and you’ll be walking through the most gorgeous landscape. This monsoon trek in India is a must for adventure lovers. Harishchandragad is one of the top monsoon treks in India because it takes you to the famous Konkankada, a cliff shaped like the hood of a cobra. Most experienced trekkers yearn to complete this trek and see the cliff. If you’re looking for a challenge, this is one of the top treks to pick, because it requires you to negotiate boulders and clamber over rocks. While other treks in Maharashtra take you through lush greenery, the Harishchandragad trek takes you over rocky patches, steep inclines, and some scary drops. You’ll also get scenic of the Saptatirtha lake and the Kedareshwar temple. Lohagad or literally the iron fort is one of the most popular monsoon treks in India, because it is suitable for beginners, and takes you up to a well-preserved ancient fort. This easy trek winds through rain-drenched trails with streams running across, over slippery rocks and up to the misty fort at the top. The main attraction of this fort is the famous Vinchu Kata (Scorpion tail), as it resembles the tail of a scorpion. The tail is roughly 2 kms in length and the view from the top is captivating!